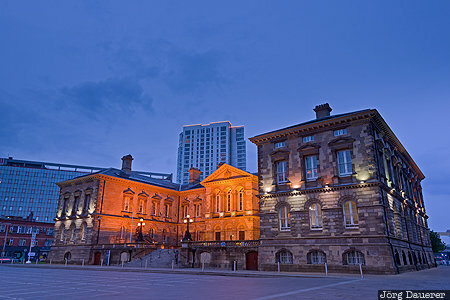 The flood-lit neoclassical Customs House in downtown Belfast at the blue hour after sunset. Belfast is the capital of Northern Ireland, United Kingdom. This photo was taken in the evening of a cloudy day in June of 2016. This photo was taken with a digital camera.